Building Bridges: CBR Students Work with DC Homeless | American University Washington D.C. 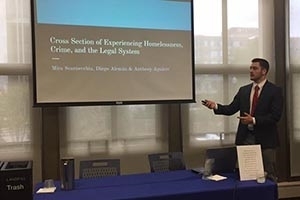 AU students present research findings on homelessness. As the District of Columbia faces intractable social problems, American University has made concerted efforts to aid the local community. The Community-Based Research Scholars program, directed by School of Public Affairs Professorial Lecturer Jane Palmer, is a shining example of this. Palmer and her CBR scholars and certificate students partnered with Thrive DC to help, and understand, the city's homeless population. The venture appeared to be a win-win for everybody. "It's really important because it's mutually beneficial for the community and the students. And what the students spend their time on has a real impact on the clients at Thrive DC and the nonprofit," says Palmer. In the fall, Palmer and her students discussed affordable housing, gentrification, poverty, and other issues pertinent to the area. But in the spring, they put those ideas into action. Located in Columbia Heights, Thrive DC is a nonprofit that wanted to know more about its homeless clients. Since Thrive DC has a breakfast and dinner program, Palmer broke her class into two groups to conduct lengthy interviews with homeless people during those two sessions. After collecting their results, students used qualitative and quantitative software to analyze the data. The students presented their findings to Thrive DC, which hopes to use this feedback for grants to expand and improve its services. "I think this is a real bridge of the academics and the community. Some community service work is disconnected from the classroom, and this was very much integrated," Palmer says. "This is actually going out into the community, meeting real people. Not just seeing them as a data point, but seeing the human across from you." Though all students asked the same questions, students later focused on particular areas of specialty and interest: veterans' issues and social safety net matters; transportation and support systems; housing access issues; legal issues; satisfaction with Thrive services; and health and substance abuse. Laurel Booth is pursuing her CBR certificate and she's in the three-year Public Health Scholars Program. She naturally focused on the health section, and she highlights the human element of Thrive DC's work. "It kind of inspired me as a researcher," says Booth. "I learned that research isn't always sitting behind a computer crunching numbers. It's talking to people." If students believed any stereotypes about homeless people, they were thoroughly debunked after meeting them. They talked with people who had master's degrees, but still ended up out of work. Students also found that substance abuse was generally not the catalyst for clients' woes. The CBR students who worked with Thrive DC. "In the dinner program, a very small percentage of people said that they had used alcohol or drugs on a regular basis," says Maya Pollack, CBR scholar and international studies major. "You put those characteristics down with people who are experiencing homelessness, and then we go to interview them and we're just completely proven wrong." Palmer's class discussed some of those issues beforehand. "I think the class really prepared us well," Booth says. "We reviewed common, negative stereotypes. 'People might be dirty, or lazy'-that kind of nonsense. But it was really great to reaffirm that you're just talking to people. They're people who are for whatever reason going through what they're going through, but who are still interested and happy to talk." Thrive DC has built a strong, supportive community. In fact, there are some low-income residents, no longer homeless, who still return to Thrive. In addition to her class, Pollack volunteered with Thrive DC all year, and she was initially shocked by the general aura of optimism there. "We'd just have regular conversations, and I would say, 'How are you doing today?' And they would just say, 'It's a gorgeous day out. It's wonderful,'" she explains. "So even with people who are going through really hard times, I'm finding that they're so positive." "They were very charismatic, and that was something that I didn't expect," adds Grace Lopez, a CBR scholar who is also pursuing the CBR certificate. You might presume a cultural gap between college students and the city's homeless, but the students noted that clients were approachable and open. And Palmer's class made additional efforts to facilitate constructive dialogue. Lopez, who is fluent in Spanish, interviewed several Spanish-speaking homeless residents and established an immediate rapport with them. In learning about other people's predicaments, they grasped the societal roots of homelessness. "You have that 'individual choice versus structural' argument when it comes to some social problems. And they came to better understand that there are traps that people can get in that are more structural," says Palmer. "That's a really good learning experience for them." Palmer knows this is a demanding project for three credits. But she believes that if given responsibility, students will deliver. Lopez certainly appreciated the experience of presenting the research findings. "It was an opportunity to do something that freshmen usually wouldn't do," she says. This also heightened students' empathy for vulnerable people. "The homeless population is one that I didn't think of prior to this. And this has kind of instilled in me this passion to talk about it, and want to help," Lopez says. "I really want to continue my work and volunteering with Thrive DC," says Pollack. "I know it's not required. But I just started creating relationships and friendships-I started feeling part of the community-and I don't think I could top it."